Pre Draft Report: Cesar Hernandez was signed out of Valencia, Valenzuela in July 2006. Pre-signing scouting reports are apparently non-existent as Hernandez wasn’t one of the Top 15 or so international prospects typically covered by most outlets. Career Synopsis: Hernandez began his professional career in the Venezuelan Summer League in 2007 at age 17. He posted a .276/.328/.436 line with a 30/11 K/BB ratio with 6 SB in 10 attempts. He followed this up in 2008 with a repeat season in the VSL, improving across the board with a .315/.412/.426 line, with an outstanding 22/33 K/BB ratio and 19 steals in 26 attempts. 2009 marked Hernandez’ first season stateside, getting 150 PAs with the GCL Phillies. Playing most of the season at age 19, he hit .267/.351/.313 with a 20/17 K/BB ratio and 13 steals in 18 attempts. Following the ’09 season, Hernandez participated in the Florida Instructional League, where his performance stood out among scouts. 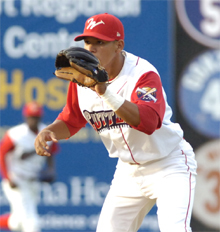 Hernandez spent 2010 in Williamsport and firmly established himself as a legit prospect. His .325 average placed sixth in the NYPL. His .390 OBP was fueled by another outstanding K/BB ratio (27/26). His base-stealing improved as he stole 32 bases in 38 attempts and was a NYPL midseason All-Star. Baseball America ranked him as the #9 prospect in the league. Hernandez again participated in the FIL, before heading home to play in the Venezuelan Winter League (although he logged just 39 Abs there). Heading into 2011, Hernandez is ranked 19th among Phillies prospects by BA and 11th by John Sickels. In addition, mlb.com ranked him as the 7th best 2B prospect in baseball. Scouting Report: Below is an assessment of the player’s raw tools. The grades are based on the 20-80 scouting scale. To understand more about this, check out this page. In addition to the individual grades, I’ve included an Overall Future Projection grade which is a summary that gives an idea of what the player’s role is likely to be in the majors, if he gets there. Summary: Hernandez saw his contact rate dip in 2011, but part of that was being double jumped to a very pitcher friendly league. Still, I need to see him make better contact in 2012 before upgrading his hit tool anymore. His power is well below average, but he may develop enough strength to become a doubles hitter as he maxes out physically. His speed and defense are still assets. BA says that some scouts believe he looks more natural at SS than 2B. If, as is said, Cesar has the good range, strong arm, and good glove to play SS, then why not move him there ASAP? J-Roll’s deteriorating baseball skills are more apparent than Utley’s who, when uninjured, shows almost all of the skills of 2-3 years ago. The idea is to get Utley fixed and with better health he should return closer to the “real” Utley we knew. Playing at SS beginning this season, Cesar could progress to be available for Phils SS in two years, i.e., 2013. J-Roll might then be ready, and the Phils themselves might agree, to hang ’em up. He still has the skills of a fine fielding SS. We surely know that J-roll hit his prime in 2007. It is now 4 yrs later and we still have great memories of him in that MVP season and many times in his Phils career. I will miss him but for now I hope he can regain in 2011 his standing as one of the best in MLB. Why aren’t people excited about Cesar? He broke out this year, and obviously he has to keep it up. But it seems like people lean more toward “wait and see” or “nah, I don’t like him that much.” His stats rival Utley’s at the same age and level. He has speed, some fielding, and has improved his bat. He’s turning 23 soon. I just don’t understand why he wouldn’t be considered a successor to either Utley or JRoll, in the very near future. It’s a good point – we probably should be getting more excited. But the reason we are not as excited is because, truly, he is NOT comparable to Utley – not even the minor league version of Utley – and it looks like Utley is doing great this year and will probably be re-signed if he’s fairly healthy (And why not? He’s on his way to a 5-6 WAR campaign and, as a second baseman who’s in his mid-30s, he’s almost sure to be underpaid next year [probably 3 year contract in the $12-14 million per year range]). So if Utley is signed, where does Cesar go? This is the issue. Cesar isn’t a shortstop, so there’s really no place for him to play but second. Utley, I suppose, could play a little outfield or third, but do you see that happening? I don’t. So, it’s not that we’re not excited by Cesar, it’s just that it’s hard to envision his role in the majors with the Phillies through 2015.